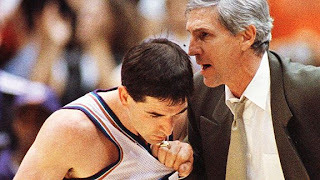 After 27 years with the Utah Jazz, 22 of them as Head Coach, Jerry Sloan has retired. I'm posting about this because Sloan has been the Jazz's coach since I started playing and following basketball, and I have always loved his coaching style. I wish I could have seen him play with the Bulls back in the day. While it's tough to see him leave, I wish him the best and thank him for the great coach and example of hard work he has been. Win or lose, he always saw room for improvement, which to me is a great message to all of us to never get complacent with anything we do, but to always try to be better. Sloan has always been Old School, and that style of ball has been dying for a awhile now. I honestly think it officially died today with his retirement. 40 current NBA ball players weren't even born when Sloan started coaching, and while he's been the coach of the Jazz there have been 245 head coaching changes in the NBA! The dude is a legend.